Ugly People Beautiful Hearts is a poetry book with over 70 poems that explores loneliness, quiet sadness, bursts of happiness, and contentment over the fact that everything you have, will eventually go away. But that's sort of beautiful in its own right. It has verses moving between the feelings of loving someone, feeling loss, trusting the night sky, losing your light, resolving that hurt is beautiful, and finding compassion in a stranger's smile. I have recently started reading poetry, and Ugly People Beautiful Hearts is a great example of why everyone needs to read poetry. This book was achingly beautiful. The poems resonated with me, Marlen's words touching me deeply. There were several poems that had me tearing up, and others that had me nodding my head as I read. 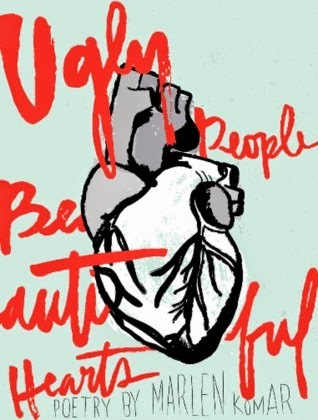 Ugly People Beautiful Hearts is about love, loss, and living through it all. As I read I felt a sort of ringing truth to Marlen's words, deep inside. I am going to share my favorite poem from the book here for you to enjoy. If you like this poem, you'll love the book. Everyone always talks about love. But I, I like loss the best. There you are perfect, just a carbon copy of all my best memories. In my grief you are all the 3 ams, all the whispers caught in the nets of bedsheets, all the cold morning light breaking against two still asleep. All the mittened hands entwined, all the kisses stolen at red lights, laughs rung out in alley ways. In my suffering you are all the spoken meters in market place flowers, all the promises pressed into the backs of wrists. All the blue skies caught in blue eyes. I much prefer loss. Because in loss, I'll keep you forever. And in love, you'll always take back what was once given so freely." Isn't that just beautiful? I loved this book and highly recommend it. Thank you for your review! As a writer I started out with poetry and drifted away from it... I'm excited to read this book! I think you'll love it. It's so achingly pretty.